A very attractive yet rarely seen flowering bulb is Rhodophiala bifida. It is originally from Chile, Uruguay and surrounding areas, and is useful as an Autumn flowering bulb. Of the 45 -50 Rhodophiala species very few are offered for sale. Sometimes referred to as the ‘BloodLily’, ‘Hurricane Lily’ or ‘Ox Blood Lily’. Pink and white species are also available for sale at times. This bulb was previouslt known as Hippeastrum adevenum, and indeed it is a part of the amazing Amaryllis group. Widely grown in the southern USA where they seem to have hybridised the species a fair bit. 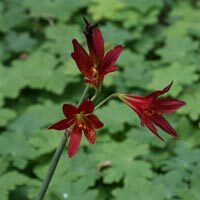 We have been growing this easy bulb in containers for a number of years, it flowers reliably every autumn and is very easy care. Rhodophiala bifida (above) grows well in pots or in a well drained, sunny position in the garden. Will produce offsets which can be separated during dormant periods. Preferring a sunny well drained position and a dry summer dormancy Rhodophiala bifida springs to life when the autumn rains are about to begin. Propagation is from seed or by offsets. Some moisture over summer is important, a desiccated soil at this time can harm the bulbs.